As we wrote about in detail a few months ago, sloths have a pretty low-key lifestyle. They can hang upside down much of the day, moving slowly when they move at all, while only going to the bathroom once a week or so. That’s a consequence of having to live on very little nutritional energy from a diet mostly composed of tree leaves. New research published in the journal The American Naturalist suggests that in this low-energy group, some sloths are more slothful than others—and one species has the lowest field metabolic rate ever recorded in a mammal. An animal’s field metabolic rate, or FMR, is its daily energy expenditure in the wild. Scientists had calculated it for three-toed sloths in the 1980s, but no one had ever gotten around to doing the same for two-toed sloths (which split from their distant cousins more than 40 million years ago). Ecologist Jonathan Pauli and his team from the University of Wisconsin decided they should, and while they were at it, they wanted to see how the two groups of sloths stacked up against each other. 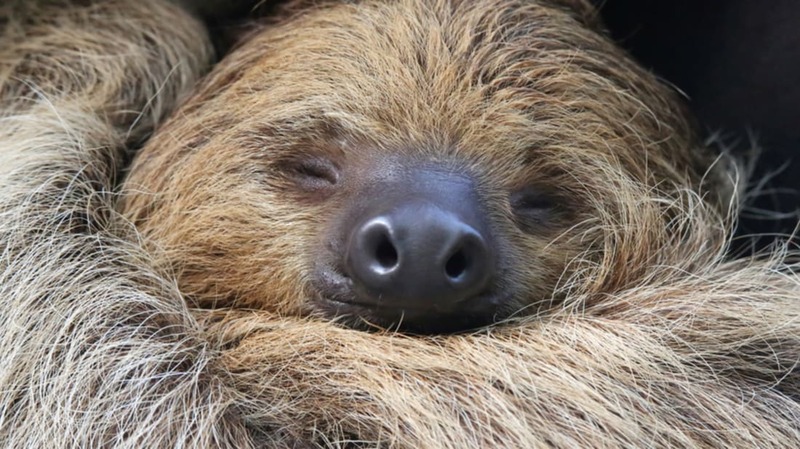 To measure how much energy the animals used over the course of a day, the researchers captured several brown-throated three-toed sloths and Hoffmann’s two-toed sloths in Costa Rica. They took blood samples, and then injected the sloths with water “labeled” with specific isotopes of oxygen and hydrogen. After tracking the sloths for a week and a half, the scientists drew their blood again and looked at how much of the isotopes remained to calculate the sloths’ FMRs. During that week and a half, the researchers also monitored the sloths’ body temperatures, how much they moved each day, and where they went. They found that the brown-throated three-toed sloths' FMRs were 31 percent lower than the two-toed sloths'. That’s impressive conservation in a group of animals that is already pretty judicious about expending energy. What’s more amazing is that the three-toed sloth’s FMR is lower than what’s been measured in any other mammal outside of hibernation. How do the sloths get away with using that little energy day to day? The researchers say it's a combination of behavioral and physiological characteristics. First, the three-toed sloths aren’t very mobile, even by the low standards of sloths, and only traveled around 160 feet per day (the two-toed sloths, meanwhile covered about 480 feet daily). Second, their body temperatures fluctuated much more than the other sloths and rose and fell with the ambient temperature. The sloths still need to keep their temperature within a certain range, but instead of regulating their temps with metabolic processes, they adjusted their thermostats behaviorally. They inched their way higher into the trees during the cool mornings to warm up in the sunlight, and then made their way back down into the shade as the day went on and the ambient temperature increased. The researchers decided to take their comparisons a step further and compared the sloths’ FMRs to those available for other arboreal folivores (that is, animals that live in trees and eat their leaves). They found that the more specialized in this lifestyle an animal was, the lower its daily energy use. The adaptations sloths need to live on such little energy—slow movements, low metabolic and digestive rates, and thermoregulating behaviors—are a unique combination (they also need another odd adaptation to live hanging upside down from branches). These “unexpected, and even bizarre, characteristics,” Pauli’s team concludes, may help explain why arboreal folivory is such a rare lifestyle (it occurs in less than 0.2 percent of mammals), and why sloths and other arboreal folivores haven’t diversified as much as groups with other lifestyles. “A suite of adaptations, rather than a single key innovation, is necessary to support an organism exploiting a lifestyle in the trees,” the team writes. The constraints of the diet available up there and traits required to exploit it don’t make it a very attractive place for the arboreal folivores to branch out—so they haven’t.